I for one, an enormously grateful to Penguin. Because if it wasn't for them most of my presentations about interesting, imaginative, clever digital/real things people have done would be empty. They'd probably get my vote for Marketing Company Of Recent Years (if such a thing was votable). Which makes it all the more surprising that I was so churlish when they tried to send me a book a while ago. I think they probably just the felt of the brunt of my pissedofness about all the stupid PR blog/outreach email you get. Which has only gotten worse recently. But, the thing you have to applaud them for; they remember. So they very, very delicately reached out today to see if I'd be interested in a copy of Mark Penn's Microtrends. And yes, I would, because I imagined there'd a student planner or someone out there who'd like a copy. And hearing that, they've offered 5 copies so now we can have a Special Mark Penn's Microtrends Prize Give-Away Competition. The rules are these. Go and have a look at the Microtrends site and have a look at some of the ideas he's put in the book. You don't really need all the data that Penn has at his disposal, you just need to do some good noticing and think of a good name. Stick them in the comments below. Not too long, please.The best 5 new Microtrends win a copy of the book. (Best means some combination of Clever/Insightful/Funny/Lateral.) If we don't get 5 entries then we'll donate the books to a good home. Oh, and I forgot to suggest a deadline - how about 9pm (GMT) on Thursday? The "Johnny-blog-lately"s - people new to blogging who ask the same questions and engage in the same meta-blogging as people did 5 years ago. The unrich - young working couples that make over $100K a year but would never classify themselves as wealthy. The indie plumber - The increasingly common, exceptionally unattractive bi-product of indie style (in particular the low-rise skinny jean) expanding to the more pudgy masses. The Unwell - people going online, erroneously diagnosing themselves with worst case scenarios on the basis of symptoms and no knowledge. The Undead - people kept alive beyond what would have been their lifespan a few year ago as a result of medical advances and moral confusion - resulting in great emotional and financial costs. McJobs Seniors - men in their 50s and 60s are appearing at supermarket checkout tills and other retail and service venues as a result of redundancy from dying industries. Single men, approaching or past their retirement age, moving to China or the South East Asia. Usually taking teaching jobs, attracted by the nice weather, cheap booze and lots of women. People buying property and moving to sunny/nice locations abroad and working remotely from there. The Apple-doesn't-make-me-cooler-precisely-because-thinking-different-does micro trend. 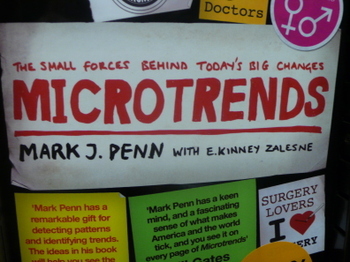 Read the micro trend's name twice and you won't need an explanation. Playground Papa's - think the prom king from little children (movie) or joe from brothers and sisters (tv). Men who embrace being the primary caretaker and man of the house-hold chores but also make sure they stay manly. (This does not require any infidelity though the ex's suggest it.) Also known as the triple P's (add Progressive) and/or Soccer Dads. Diversuburbanites - You won't find diversity in major cities anymore, you'll have to go out to the surrounding suburbs. And that's what many recent grads and young families are going to do to have a more rich and multi-cultural life. Thru-breds - People who grew up IMing, texting, blogging, etc. but now fail to use proper grammatical English in the traditional world. This slang/shorthand is not just used in emails but also infiltrates presentations, legal documents, and love letters. Sorry if these are too U.S. focused. "do some good noticing" - that's a phrase i'm going to adopt. this was a genuine comment not a competition entry by the way ! The micro-trend within advertising where everybody wears converse and a cardigan! Yuffies (Young Urban Frequent Flyers) - twentysomethings with long-distance relationships as a consequence of cheap flight tickets, common cultural references and the internet. Everyday Freakonomists - people who have read 'The Tipping Point', 'Freakonomics' (and perhaps 'Microtrends') and since then adopted a similar way of thinking. Those who lead a semi-nomadic existence in large urban cities. Building a web of 'home places' to minimise the impact of unnecessary travel - basically staying at friends flats and leaving things at work so they're easily reached without travelling to zone 4 three times a day. a person around/between 12-16 years old who spends a disproportionate amount of time using electronic devices like cell phones, digital cameras, computers, video games. This person is advanced in their knowledge of the functionality of an electronic device as well as its social capabilities. A technolescent is probably fluent in a language belonging to whichever sub-group of technolescents that person associates with. A person who fits into this definition can also spread themselves over several technological sub-groups. People still consider themselves young when in their mid thirties. Unfortunately the fertility of women drops quite dramatically around the age of 35. So even though a woman is in a relationship and she likes the idea of having children of her own, it might never happen – because the body and the mind ages differently. Hence childless by indecision. Independent, free-spirits who continue to eat bacon butties in defiance of yet another nanny state report. An increase in divorce and re-marriage (even re-re-marriage), step parents, step childen, ex-step parents etc. has led to an increase in the 'ex'-tended family. This throws up mainly dilemmas. What's people relationship to their ex-step brother in law? What do you even call him? Do they get invited around for christmas? But also some positives. E.g. 'I'm related to Thierry Henry.... well, his ex-wifes step father is my step-mothers brother. And all the good things that result from knowing and being related to more people in the world. Why can't i just find a plain pre-packed cheese sandwich Central London? People that read a lot of blogs and leap at the chance to show how clever they are in the comment box. hardworking hedonist - hedge fund managers, derivatives traders with sleeping bags underneath their four-screen bloomberg/reuters souped-up computer programme. make a pile of money then wash them all down with bottles of moets and splash them blings. arigatomiser - only happens in japan, hong kong, or areas with lotsa asian population. bathing ape x nike airforce 1 x goretex x hilton hotel (why not?) sneakers customised to the soles. working class heroes - not john lennon. but more roman abramovich or thaksin shinawatra. common trait - made their pile from dodgy government concessions. big idea populist - malcolm gladwell/james surowiecki/any (mostly new yorker) writers with the talent for spotting big themes, connecting the dots, and translating them for the masses. this normally results in catchphrases such as "tipping point" or "wisdom of the crowds" or frekonomics". Young and Scarried- These 23-30 year old couples are just as afraid of marriage as the rest of their generation, but they are not afraid of commitment. They live together, have happy relationships but put off officially tying the knot. Masturbloggers- These individuals only post diary-like personal information that no one else could ever enjoy reading. Postographers- This new form of photo enthusiast takes pictures for the sole purpose of posting them on their social networking page. Can be overheard in public places saying "that is sooo going on my myspace page!" right after the flash goes off. Phone Phobics - people who wont give up/reduce their phone usage but won't hold it to their ear for fear of radiation and so talk into it as if on Star Trek. Localites - urbanites who are actively taking part in rebuilding and participating in a local community around where they live.